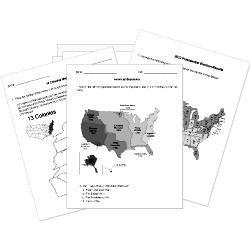 You can create printable tests and worksheets from these Grade 10 American Revolution questions! Select one or more questions using the checkboxes above each question. Then click the add selected questions to a test button before moving to another page. This word means a preliminary or preparatory statement; an introduction. What war caused England to find new ways of taxing their American colonies before the American Revolutionary War? Why did the writers write the Declaration of Independence? What document inspired the colonial soldiers to fight harder because it included rights for all Americans? Commander of the British army during the Revolutionary War. The Battle of began on Christmas night in 1776 and the ensuing victory boosted the Patriots' spirits. This word means agreed to by everyone. During the American Revolutionary War, why did the rebels (colonial army) kill the Native American scouts first? The Battle of greatly boosted American morale and led to increased foreign support for the Patriots. The Battle of Bunker Hill showed the colonists that they could hold their own against the . This word means something that is stated or made known in an official or public way. This word means to officially end.